1. Blake. America, copy R, frontispiece (pl. 1). Relief and whiteline etching, 23.4 × 16.9 cm., printed in blue ink. Photo courtesy of Christie’s New York. Copy R of Blake’s America has been known for many years only through fragmentary accounts in sale catalogues and the more direct but dubious evidence offered by William Muir’s facsimile. The original volume came to light in 1987, precisely one hundred years after the publication of Muir’s lithographic imitation and, according to Blake Books, its last recorded appearance in the marketplace.1↤ 1 G. E. Bentley, Jr., Blake Books (Oxford: Clarendon Press, 1977) 106. Plate numbers and copy designations follow Bentley’s enumerations. The return of copy R to public notice permits a more accurate description of its characteristics and its history of ownership than has heretofore been available in the literature on Blake’s illuminated books. The volume in question was consigned by a Philadelphia collector for auction by Christie’s New York in the summer of 1987. Christie’s and one of its bibliographic consultants at first believed the book to be a lithographic facsimile. Seeking another opinion, the auction house sent the book by air express to Thomas V. Lange, Associate Curator of Rare Books at the Huntington Library, San Marino, California. Some years ago, Lange discovered the two lithographic plates in America copy B (Pierpont Morgan Library, New York), thereby demonstrating his considerable expertise at discriminating between Blake’s originals and forgeries or facsimiles.2↤ 2 See Lange, “Two Forged Plates in America, copy B,” and Joseph Viscomi, “Facsimile or Forgery? An Examination of America, Plates 4 and 9, Copy B,” Blake: An Illustrated Quarterly 16 (1983): 212-23. 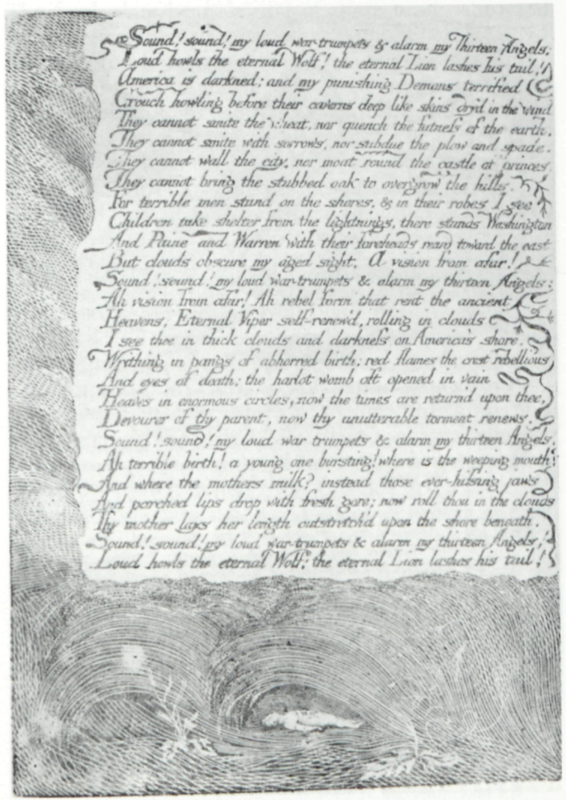 Lange immediately recognized the volume as an original illuminated book printed by Blake. Thanks to Lange’s generosity, and the kind permission of Stephen Massey and Chris Coover of Christie’s Book Department, I was allowed to inspect the book while it was at the Huntington. I base my identification of the rediscovered America as copy R on its relationship to Muir’s 1887 facsimile. The latter is printed on rectos only, whereas the original contains eighteen plates on ten leaves, with plates 1 and 2 (frontispiece and title page) facing each other on separate leaves and the remainder of the plates printed recto/verso.3↤ 3 Bentley, apparently relying on the facsimile, describes copy R as eighteen plates on eighteen leaves (89). Further, the plates of the original exhibit a considerable range in blue and green ink colors, and these are not followed closely in the facsimile. There is, however, one convincing type of evidence linking Blake’s book and Muir’s. Almost all impressions from Blake’s relief-etched copperplates have some “foul” inking—that is, droplets or smudges of ink in the etched whites or on incompletely wiped relief borders. Some patterns of foul inking appear on more than one impression of a single plate, but the vast majority of impressions have some unique features. It would be almost a statistical impossibility for two copies of an illuminated book the length of America to have the same accidental ink deposits throughout all their impressions. Muir’s facsimile does not reproduce every tiny droplet in the rediscovered America, but more than enough smudges and dots are shared by the two works to make it virtually certain that the original is the prototype Muir used for his partly photographic, partly hand-drawn, lithographic copy. For example, the original frontispiece (illus. 1) shows some rather messy over-inking that clogs the white interstices of black-line crosshatching just to the left of the winged giant’s right leg. A very similar inking effect appears in Muir’s work. 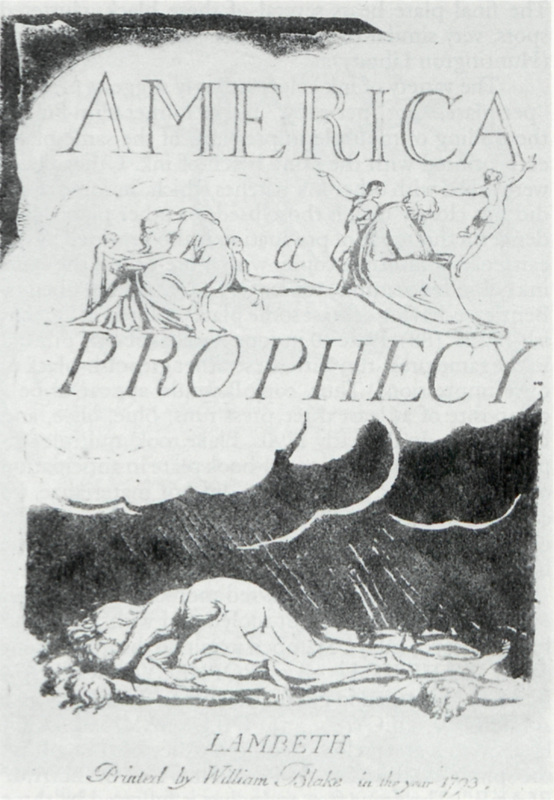 The smudges to the left of the “A” of “AMERICA” on the title page, between the “E” and the “R,” and most other ink deposits visible in illus. 2 are captured by Muir (see illus. 3). He also reproduces the shadow lines of foul inking just inside the white cloud bearing the text on plate 10 (illus. 4). The basic physical features of America copy R can be most conveniently set forth under the following specific headings. Plate States: Plate 13 is in the second state, with only one tail on the serpent, as in copies A-D, H, M-Q. All other plates are in the published states appearing in all other complete copies. Paper: Ten leaves of wove paper trimmed to 36.4 × 25.5 cm. The fifth leaf, bearing plates 7 and 8, shows the watermark “E & P” lower left (when viewed from the recto). Blake used this paper, manufactured by Edmeads and Pine, in at least twenty other copies of his illuminated books, including seven other copies of America (C-E, G-K [there is no J]). The leaves were cleaned in this century (see Provenance, below) and apparently dried under heavy pressure. As a result, there is no indication of the light platemarks almost always present in unwashed impressions of Blake’s relief plates. The absence of these slight indentations, and the rather flat appearance of the inked areas, probably contributed to the now-rejected opinion that the volume is a lithographic facsimile. The blank recto of the frontispiece is slightly stained; the title leaf has a pinhole, now patched, left of the imprint. The recto of the fifth leaf (pls. 7/8) shows slight foxing along the right margin. The sixth leaf (pls. 9/10) has a short tear, about 1 cm. long, at the top edge with some loss of paper. A small circular stain mars the flames lower right on plate 17; plate 18 is slightly foxed and bears a small stain over the “s” of “bands” in the seventh line from the bottom. Inking and Printing: Many plates show bold reticulations in the ink, much as in the dark sky above the prone figures at the bottom of the title-page design (illus. 2). These maculated patterns are probably the result of a very viscous ink, insufficiently dampened paper, or a combination of both. The blue and green ink hues vary considerably from plate to plate, as listed below with other information on inking variants. Plate 1 (illus. 1). Blue. Plate 2 (illus. 2.). Blue. The top left corner of the etched border and the dark sky between it and the cloud outline are printed with no evidence of wiping. In some copies, this area is partly (e.g., N) or completely (e.g., E) uninked. The border left of the figures above “PROPHECY,” printed in copies I and N, does not appear in this copy. Plates 3-8. Blue. The word “Preludium,” printed from a small separate plate (e), appears above the upper design on plate 3. The final four lines of text on plate 4 have been masked in printing, as in copies B-F, H-M, and a. Some letters on plate 5 are smudged, as though the plate moved slightly in the press, and streaks in etched whites suggest an attempt to wipe away foul inking. 2. Blake. 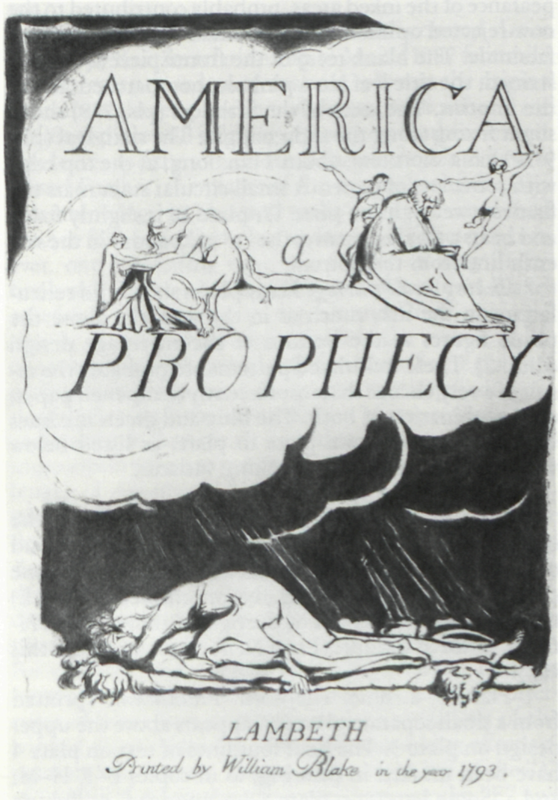 America, copy R, title page (pl. 2). Relief and whiteline etching, 23.5 × 16.7 cm., printed in blue ink. Photo courtesy of Christie’s New York. Plate 9. Bluish-green tending toward olive along the lower edge of the image. Plate 10 (illus. 4). Dark olive green. Plates 11-12. Light blue. Plate 11 (illus. 5) is lightly inked and has several printing flaws in the hatched areas, lower left. Plate 13. Blue, with over-inked patches in the dark sky. A few plates show small black ink spots, perhaps offset or rubbed off from another print when still damp. begin page 140 | ↑ back to top The final plate bears several of these black, clustered spots, very similar to those on the same plate in copy I (Huntington Library). The variety of ink colors strongly suggests printing “per-plate,” not “per-copy.” By the former term I mean the pulling of multiple impressions of the same plate, each printed with the same batch of ink. Other plates were inked with other ink batches which, in some cases, did not closely match those used for other plates. Evidence for this mode of production is also provided by the existence of multiple copies with more-or-less the same ink color; for example, copies C-G, I-L, all described by Bentley as having at least some plates printed in “greenish-Black” (88). Plate 10 in copy R was probably printed in the same press-run with these other greenish-black or olive impressions. Thus, copy R would appear to be a composite of at least three press-runs: blue, olive, and blue-green. 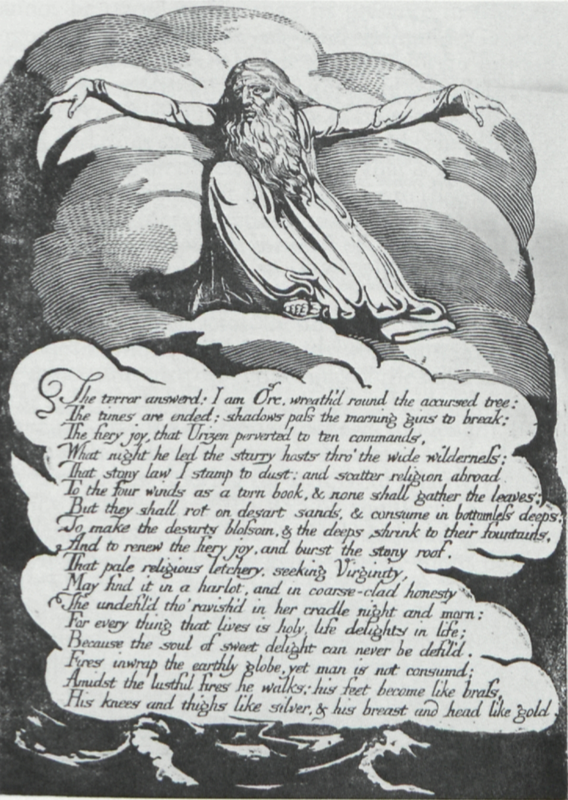 In the early 1790s, Blake took multiple impressions of each illuminated-book plate in anticipation of multiple sales. When these did not materialize, he changed in the later 1790s to per-copy printing of each copy of an illuminated book as a unit, taking only one impression from each plate to create a single volume. Binding: Modern plum-red morocco by Sangorski & Sutcliffe, elaborately gilt tooled and with green and black morocco inlays. Stamped in gilt on the upper front cover, “AMERICA/ A PROPHECY/ WILLIAM BLAKE.” Stamped in gilt on the spine, “AMER-/ ICA,/ A/ PROP-/ HECY/ . . ./ WILL-/ IAM/ BLAKE.” Housed in a green cloth folding box, lettered in gilt on the spine, “AMERICA/ A/ PROPHECY/ -/ WILLIAM/ BLAKE.” The front free endpaper is followed by three fly-leaves, the first of which bears the armorial bookplate of Christine Alexander Graham and (below) a clipping of lot 18 from the 1911 Anderson auction catalogue (see Provenance, below). The three front fly-leaves and the three at the end of the volume are variously watermarked “MBM,” “Ingres,” and “France.” The plates are bound consecutively in order, 1 through 18. Foliated in pencil, probably by a binder, 1-10, top right of rectos (including the blank recto of the frontispiece facing the title page). Another pencil number on leaf 8 recto (pl. 13) has been partly erased and is illegible. There is also fragmentary evidence of a pencil inscription, almost completely erased, on the blank verso of the title page. A pencil squiggle below might be the number 2 or 7. None of these pencil inscriptions can be attributed to Blake. Plate 3. Branch upper right, both ends of the worm at the bottom, and part of the vegetation below the bound youth above the text painted in by hand. Plate 8. Hand tinting along the outline of the skull and on both shoulders of the seated man. 3. William Muir. Facsimile of Blake’s America, 1887. Lithographic reproduction of the title page, printed in green and hand-tinted in the same color. 22.3 × 16 cm. Essick collection. 4. Blake. America, copy R, plate 10. Relief and white-line etching, 23.5 × 16.7 cm., printed in dark olive green ink. Photo courtesy of Christie’s New York. the same white hue as all others in copy R, they too must have been washed and pressed dry at about the same time. I have found no record of the book’s purchaser at the 1911 auction, but either at the sale or soon thereafter it was acquired by Christine Alexander Graham of Maryland, who also owned copy A of Songs of Innocence between 1912 and 1943 (Bentley, 404). Copy R was very probably cleaned, slightly cut down (thereby removing the gilt edges), and rebound by Sangorski & Sutcliffe shortly after the 1911 auction. The volume passed by inheritance to the late Margaret M. Sullivan of Philadelphia. Her brother, acting on behalf of Sullivan’s estate, brought copy R to Christie’s in 1987. 5. Blake. America, copy R, plate 11. 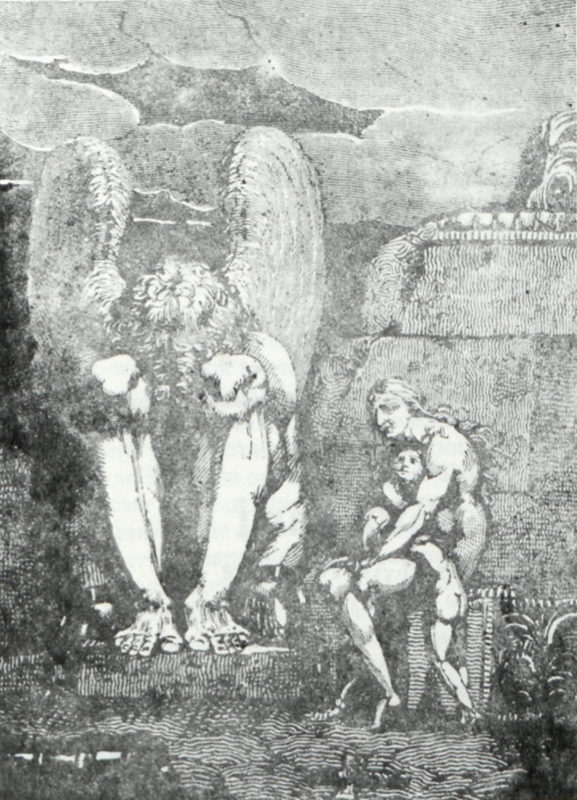 Relief and white-line etching, 23.4 × 16.9 cm., printed in light blue ink. Photo courtesy of Christie’s New York. 10.6↤ 6 The only obvious error is in the description of plate 5 as having “lines 38-41 . . . masked by Blake in printing.” These lines are masked on plate 4. America was by far the most important work in the auction, as indicated by the brave estimate of $125,000 to $175,000 and the color reproduction of the upper design and seven lines of text from plate 10 on the catalogue cover. Bidding opened at $80,000 and did not stop until reaching $160,000. With the addition of the 10% purchaser’s premium paid to the house, America achieved the new auction record for any illuminated book of $176,000. (The previous record of £77,000—then about $158,600—was set by copy D of Songs of Innocence and of Experience, sold at Christie’s London in June 1979.) The buyer was the London print dealer Libby Howie, who in December 1986 purchased at auction the upper design only from Blake’s “Ecchoing Green” for an anonymous collector. America copy R is probably destined for the same collection. I will report any further information I can obtain about the volume in my annual sales reviews in this journal. The provenance of America copy R affects the previously recorded history of copy D, now at Princeton University. Bentley (101), citing “Keynes & Wolf” as his authority,7↤ 7 Geoffrey Keynes and Edwin Wolf 2nd, William Blake’s Illuminated Books: A Census (New York: Grolier Club, 1953) 45. states that copy D was acquired by W. A. White “in 1891,” lent to the Grolier Club’s 1905 exhibition, no. 18, and sold at Anderson’s on 27 October 1911, lot 18. Since this last point is demonstrably not true, and since copy R was lot 18 in the 1911 auction, there is no documentary evidence that White ever owned copy D. Unless Keynes and Wolf had some (unstated) evidence about White’s purchase of the book in 1891, we are left with a gap in the provenance of copy D between its sale at Sotheby’s London in 1888 and its sale from the Cortlandt Bishop collection at the American Art Association, New York, in 1938. The at least temporary resurrection of America copy R is a most satisfying event in the recovery of Blake’s artistic legacy. It gives one hope that other treasures may someday arise from the caverns of history’s grave and find again an appreciative audience.